Map of Fort Bend County are where Johnson Development is planning a new community. RICHMOND, Texas – Johnson Development Corp. has acquired a 590-acre tract in Richmond, southwest of Houston, for a master planned community with 2,500 homes. The site is north of U.S. Highway 59 near the Sweetgrass active-adult community being developed by Del Webb. Johnson said development activity is expected to begin by mid-2016 with construction of new homes projected for early-2017. 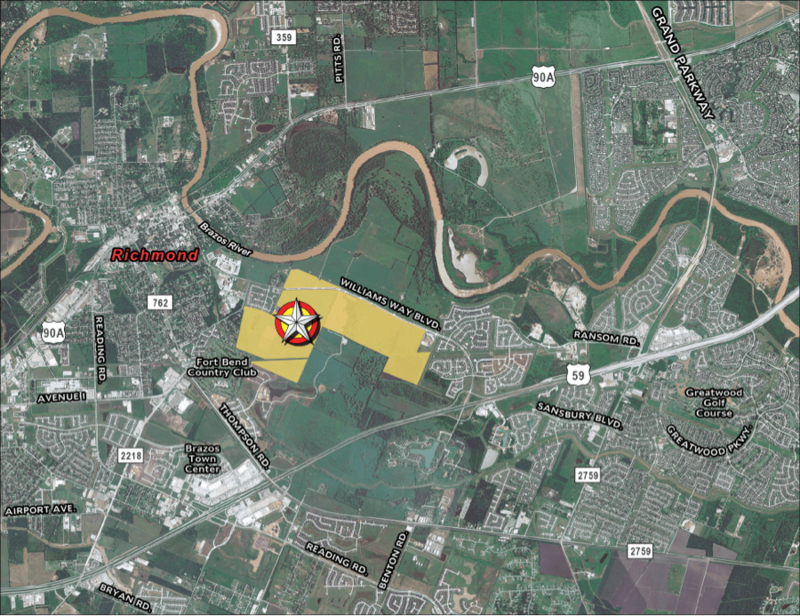 Located close to the Brazos River, the site is near the northwest corner of Williams Way Boulevard and U.S. 59. Johnson Development, along with IHP Capital Partners, acquired the property from the Henderson-Wessendorff Foundation of Richmond. Financing for the transaction is being provided by Trustmark Bank. The Henderson-Wessendorff Foundation also owns an adjacent 800 acres on the north side of Williams Way Boulevard where it plans to create a state-of-the-art nature preserve and tourism center. “This is more than a community of new homes, it is land that holds a special meaning for the Richmond community,” says Doug Goff, Johnson Development’s Chief Operating Officer. “When a family foundation says ‘we trust you to do the right thing,’ they are entrusting us to protect and enhance a legacy founded over 100 years ago,” adds Larry Johnson, President and Chief Executive Officer of Johnson Development. Trey Reichert, who currently serves as Vice President and General Manager of Johnson Development’s Riverstone, will serve as General Manager of the new Richmond community. Reichert has been part of the development team at Riverstone, ranked as the top-selling community in Texas, since 2005 where he has been responsible for the development of more than 3,000 homesites and an array of amenities, landscaping and infrastructure.